How to find & eat vegetarian food in Karakol. Vegetarian travelers in Kyrgyzstan will breathe a sigh of relief when they visit Karakol, a multicultural city with a vibrant food culture. 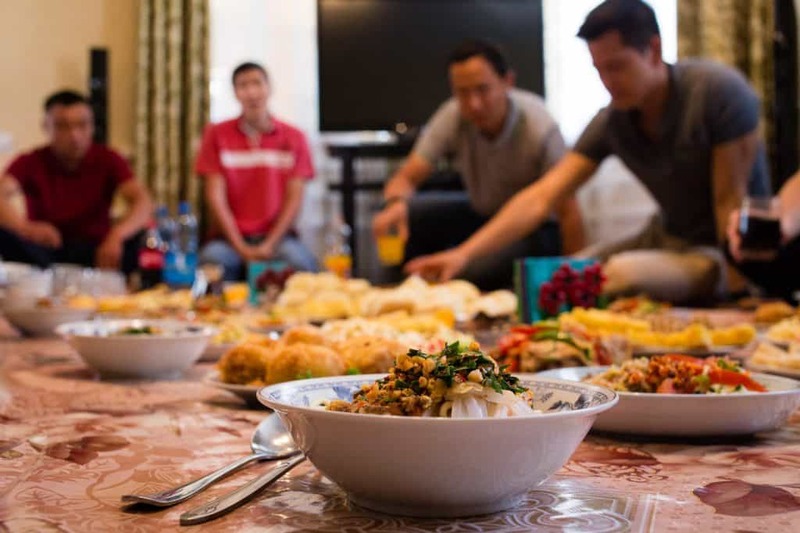 The city’s rich blend of cultures and cuisines make Karakol among the easiest places in Kyrgyzstan for vegetarians to enjoy a wide range of dishes and flavors. The best local vegetarian-friendly food specialities originate from Karakol’s small Dungan community. The Dungans are an ethnic group originally from China, and Dungan cuisine prominently features fresh herbs and vegetables in every dish — a boon for vegetarians. 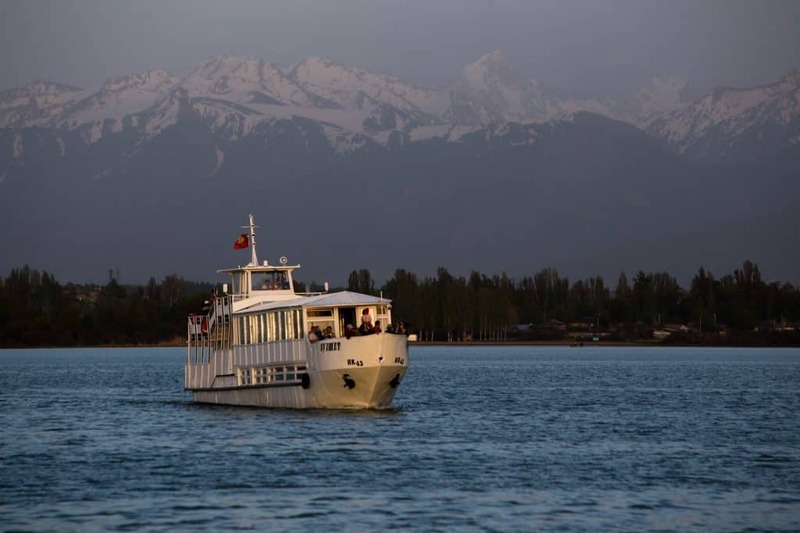 The city is also long popular with travelers who use Karakol as a gateway to country’s rich history and stunning topography. With this long history of tourism, restaurants and guesthouses in Karakol are more attuned to the vegetarian traveler’s needs. Nowhere else in Kyrgyzstan can vegetarians find such varied and flavorful cuisine. 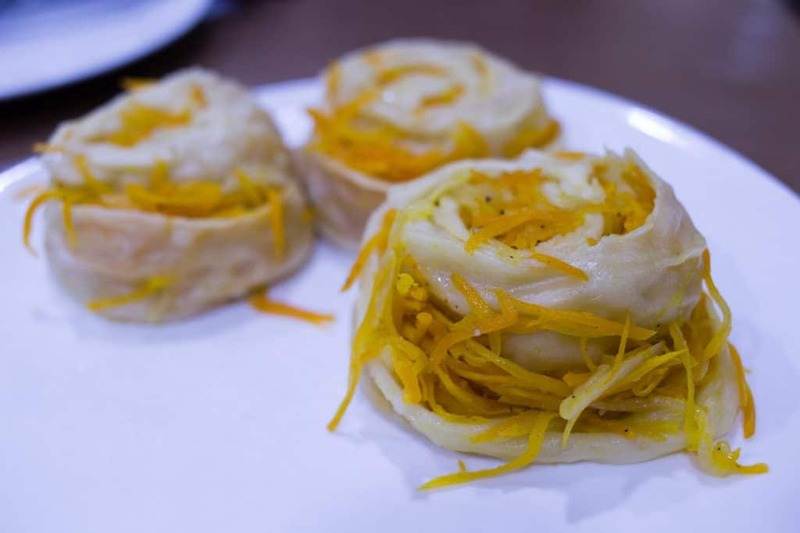 In addition to this list of recommended, easily-found vegetarian dishes and snacks, Destination Karakol's two food tours can be enjoyed entirely vegetarian: Karakol Food Crawl and Dungan Village Visit & Family Dinner. 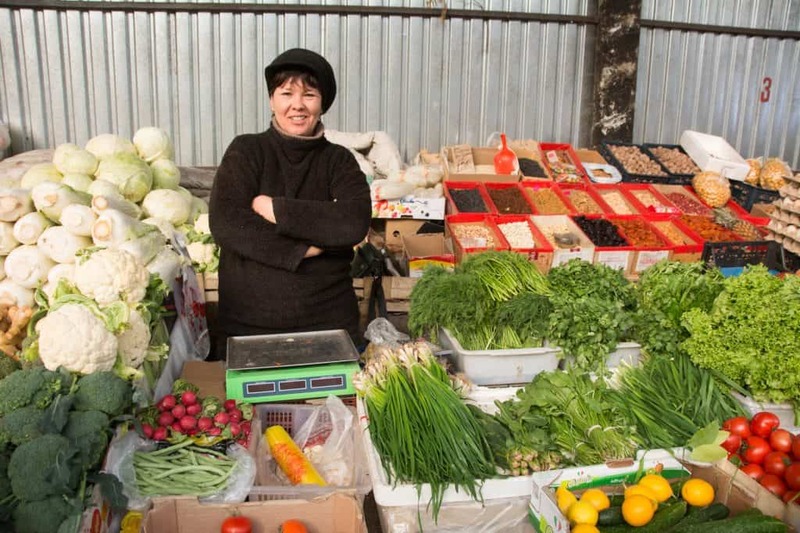 Karakol's markets always seem to be flowing with vegetables — and smiles. Some Karakol restaurants offer vegetarian menus, but it’s still best to call ahead if you’re planning a large dinner with friends or tour buddies — most restaurants receive so few vegetarians that they need hours or a day before they can serve a large quantity of vegetarian food. Either way, don’t be afraid to order a certain dish meatless — you may get a wonderfully creative version that's even better than the original! To help you best communicate with restaurants and vendors in town, consider downloading and printing the Destination Karakol Vegetarian Phrases (English-Russian) or screenshotting this helpful list of vegetarian questions and phrases you can use to speak (if you can speak or sound out a little Russian) or show the wait staff to clarify what you are looking for, or what you would like to avoid. Fresh vegetables are the heart of Dungan cuisine, and the chopped salads are often inherently vegetarian. Many salads contain carrots, cabbage, and any seasonal vegetables. With vinegar and seasonings as the base, these salads are reminiscent of fermented delicacies in other countries, like sauerkraut or kimchi. Usually, you have a choice of three or four different salads in a bowl or plate in one order. Try it here: Vendors at Karakol’s Big and Small Bazaars (open daily from 10:00 to 18:00) serve a range of salads from large vats. Or sign up for the Dungan Family Dinner for fascinating cultural experience and a chance to sample a wide-range of vegetarian Dungan dishes. This tasty, cold noodle soup is a regional specialty to the Dungan and Uighur cuisine, and one every vegetarian should sample while visiting Karakol. The dish consists of a tangy vinegar-based vegetarian broth, thin ribbons of starch (usually corn-or potato-starch), and wheat noodles, all topped with a handful herbs, chili, and garlic. Although it’s often topped with meat as well, since the vendors prepare the dish on-the-spot while you wait, you can easily request the dish without it. If you’re offered a side of piroshki, this fried, potato-stuffed pocket of dough is also vegetarian. Try it here: An entire alleyway of Karakol Small Bazaar serves ashlan-fu, or you can sample it on the Karakol Food Crawl, which can be offered entirely vegetarian! A hearty dish made with thick, hand-pulled noodles, large chunks of vegetables, and served in a savory, vinegary sauce. While this dish is not inherently vegetarian, restaurants in Karakol are increasingly willing to offer vegetarian versions of the dish. Try it here: A vegetarian version is regularly available at Cafe Zarina — it's best if you order at least one hour in advance. Or you can sample it on the Karakol Food Crawl, which can be offered entirely vegetarian! Shredded vegetables like carrots, onions, cabbage, and greens are spread onto a thin layer of dough, then rolled and steamed in a special pan. The look of the dish varies widely, but it’s tasty in all forms. Oromo is often served with meat and animal fat, but hosts and restaurants often offer a vegetarian version. Try it here: A vegetarian version is regularly available at Kochevnik Cafe — you must order it at least one hour in advance. Or you can sample it on the Karakol Food Crawl, or at Kyrgyz Family Dinner which can be offered entirely vegetarian! Manti are, quite simply, steamed dumplings, while samsa is a flaky, stuffed pastry. The manti and samsa offered in markets or restaurants are rarely vegetarian unless you request it (due to lard used in the preparation), but hosts and restaurants can prepare vegetarian versions stuffed with greens (jusai) and potatoes. Delicate, pumpkin-filled manti dumplings are a special treat in the right season. Many Kyrgyz meals include a simple but tasty tomato and cucumber salad, especially in the warmer months. Sometimes including herbs and occasionally other vegetables (like onion or peppers), these fresh salads (called svejiy or Свежий) are nearly always vegetarian — the light liquid is either juice from the tomatoes or a fragrant vinegar base. Kyrgyz culture has a long tradition of breads and it's customary in Kyrgyz culture for hosts to offer bread to guests when they enter the home. Breads can differ by region, but all are delicious. Check out the Big Bazaar to sample bread. For even easier and faster bread sampling, check the front entry way of the the Small "Bugu" Bazaar for just about every ethnic bread version available in Karakol, including Uighur and Kalmyk mini breads. Look for lepyoshka, dense rounds of flatbread; or at the yurt camps, guesthouses, and homestays, you might try borsok (small fried dough often served with honey, jam, or a clotted cream called kaimak). Try it here: You can find Kyrgyz bread at almost every shop in Karakol, also check out town's local markets to see and try different types of bread. Or you can make and sample it on our Bread-Making Workshop with kaimak (local sour cream) and tea! Nuts, dried fruit, and fried fava beans are popular snacks throughout Kyrgyzstan. You can also find an abundance of seasonal fresh fruits and vegetables (with the largest variety in summer months). You can stock up on any of these items at the local markets (especially the Big and Small Bazaars) and grocery stores. You'll also find that the vegetable vendors tend to be a friendly and welcome questions if something is unfamiliar or you are unclear on how to use or consume it. If you have access to a kitchen in your hostel or guest house, you can easily cook your own vegetarian feast in Karakol.